Successfully Added HT-60L USB Microscope - 500 Zoom, 8 LEDs, 2592x1944 Resolutions, 5MP CMOS, DSP, USB+OTG Function to your Shopping Cart. HT-60L Digital USB microscope is the ultimate in affordable magnification for hobbyist and professionals alike. The fun and useful tool is the perfect tool for inspecting fabrics and electronics, working on jewelry such as watches or model building and hobby crafts. With its 500 times magnification, this 5MP camera has a 4 to 50 CM focal range. Compatible with a wide range of systems including Windows and Android the HT-60L digital microscope can be used from your desktop or laptop and thanks to its low power requirements will even runs with a number of Android Tablet PCs and some smartphones that support the OTG function - perfect for quality control inspections or taking your digital laboratory out into the field for on the spot analysis. A halo of 8 LED lights runs around the edge of the lens and provides 600 lux of illumination to light up the visual field so you can inspect objects in extreme detail. 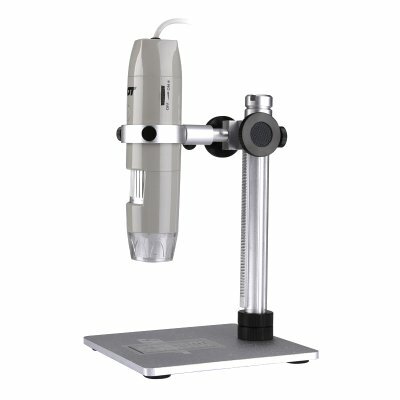 Coming with an adjustable metal ratchet stand and base this 5MP microscope has a sturdy working platform from which you can capture still images at resolutions up to 2592x1944 and record video at 30FPS. The HT-60L USB microscope comes with 12 months warranty, brought to you by the leader in electronic devices as well as wholesale USB microscopes and computer accessories..